So how does everybody feel about the Lil Cheezers Food Truck getting their own permanent restaurant space? I think more power to them. Grilled cheese is a staple food in almost every child’s life, the crunchy, hot, buttery bread, with the ooey gooey cheesy center. My mouth is watering just thinking about it. And everyone has an opinion on which way is the correct way to cut a grilled cheese. Is it in triangles or rectangles? I say without a doubt a grilled cheese has to be in triangles. Whatever your opinion or preference, we can all agree that grilled cheese is delicious and that Lil Cheezers is taking them to a whole new level. Lil Cheezers is one of the eight food trucks currently in Louisville, and that number is growing. Food trucks in the area span from Burgers to tacos to pizza and vegan options. Louisville street food is a popular new trend, supplying delicious and convenient food to the Louisville community. The Lil Cheezers food truck is taking things a step further and has moved into one of the many cursed buildings on Bardstown Road, which has most recently been Jamie’s 14k Cupcakes and Potstickers, both of which were unfortunately short lived. Lil Cheezers has been a successful food truck serving tasty spins on the comforting grilled cheese sandwich. Favorites include the Fancy Pants which consists of brie, caramelized onions, granny smith apples, and walnuts, and the Beef n Cheddar, whose roast beef and cheddar cheese melts in your mouth. The new restaurant will serve an expanded menu that I’m sure we are all eager to taste. TThe news of Lil Cheezers restaurant space came shortly after the opening of a similar restaurant only a short distance away on Bardstown Road. Tom and Chee is located next to Sapporo, across from Vint coffee. 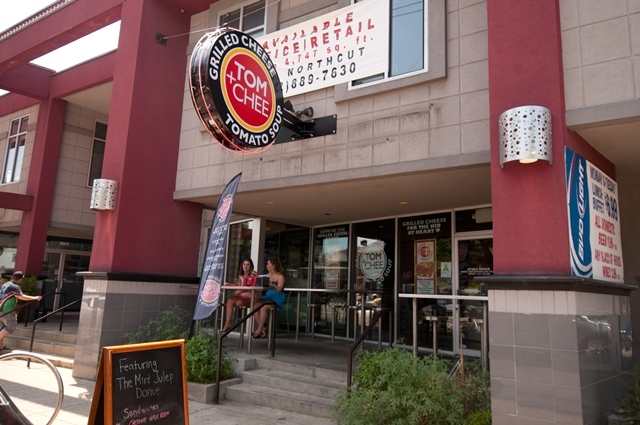 Tom and Chee is a chain made popular for it’s grilled cheese donuts and creative grilled cheeses including a Grippos BBQ and bacon grilled cheese. Tom and Chee has even attracted celebrity cliental like Man vs. Food’s Adam Richmen. Tom and Chee offers a large variety of grilled cheese options with a selection of deli meats, soups, and salads as well. There is a large section of the menu dedicated to grilled cheeses with potato chips, combining the best of both worlds! The question begs to be asked, will the Louisville food community really support two grilled cheese restaurants within such close proximity to one another? I guess we will find out soon enough, and hope Lil Cheezers can break the spell of one of Bardstown Road’s many cursed buildings. Let the best grilled cheese win! For more information on Louisville food trucks and street food, go to LouisvilleStreetFood.com and for more information on Lil Cheezers, go to lilcheezers.com. Take advantage of the powerful Louisville Real Estate search tools that are found on this website. The Summer Olympic Games are kicking off tonight in London with what is promising to be an exciting opening ceremony. There are many who think that London will struggle to match the spectacular opening ceremony of the 2008 Summer Games in Beijing, whose large scale choreographed drummers stole the show. London officials, are making clear that they have many secrets up their sleeves for their opening ceremony and that it wont disappoint. My own household is getting filled with American flags, and red, white and blue decorations, in preparations for our Olympic party tonight. Everyone coming has to wear their country’s colors and be ready to indulge in backyard Olympic games. You can feel the Olympic buzz in the air as more and more people are getting into the Olympic spirit. The Olympics bring seventeen days of pure competitive fun, where no matter what your race, religion, or economic status, you can enjoy the games with your neighbor. If you want to learn more about the Olympics, we have a rare opportunity to view some of Olympic history right here in Louisville. The JB Speed Art Museum is hosting some of the Summer Olympics most memorable and historically relevant pieces of nostalgia as part of a new exhibition. Interesting pieces include the first ever torch, from the Berlin Olympics, and the torch famously held by Mohammed Ali in the 1966 Olympics, that’s wooden handle was made in Louisville at the Louisville Slugger factory. Also at the Speed Art Museum is another exhibit focused on the Olympics; Going for the Gold: Selections from the Kebric Olympic Collection. The exhibit features 27 torches and posters from the collection of Dr. Robert Kebric, Professor of Ancient Greek and Roman History and the Olympic Games at the University of Louisville. The torches and posters explore the art and propaganda within the Olympics games. Both exhibits are open now until August 26th and there is a $10 entry fee to the Museum. For the next seventeen days every restaurant and bar with a television will have it set to the Olympics, and everyone will be discussing yesterdays medalists. Embrace the Olympics because it will be another four years before we see them again. Many restaurants will be having specials, so consider that before you make a decision on where to go for dinner. The Olympics are truly a magical time where the whole World becomes unified. Go team USA! Find your dream home by searching Louisville Real Estate. The easiest to use free MLS search site in Louisville. One of the things I love best about Louisville is the diversity within the city itself. Within ten minutes from sitting on my front porch in the Highlands, I can be skipping rocks on the riverfront, admiring the graceful horses galloping on some of Kentucky’s most beautiful farmland, or enjoying a night out sipping a cocktail in one of the newest hip restaurants. Summertime in Louisville is a time when the city in all its forms comes alive and I love to take it all in. One of my favorite things to do in the Summer in Louisville is to drive out to Prospect and Oldham County and take in my surroundings. I usually start with a drive down Rose Island Road. My two-year-old likes to call Rose Island the “Fun Road.” We love to drive down the windy street, point out the various animals in the Henry’s Ark Petting Zoo, and wave to owners as they ride their horses. The most exciting part of Rose Island Road though, are all the “wee bumps.” There are an incredibly high number of hills and turns on Rose Island Road turning it into a roller coaster if driven friskily, and boy is my son appreciative when his mom and dad drive a little frisky. As we go over each hump in the road we all scream “wee” and those not driving put our hands in the air. I have learned the simplest things are what makes my son the happiest. We usually turn onto Mayo Lane next. Mayo Lane is my favorite Street to drive down if I am in the mood to gawk at homes in Oldham County. This street is filled with some of the most breathtakingly beautiful farmhouses in Kentucky. The magnificent manors shock me every time I see them and never disappoint. These homes embody Kentucky’s beauty and wealth and every time I see them they remind me why I love being from Kentucky. By the time I’m done drooling over the mansions of Mayo Lane, the kids are usually ready to get out of the car, so I usually circle back to Henry’s Ark at the beginning of Rose Island Road by US 42. Henry’s Ark is a free petting zoo that is run entirely off of donations. It was opened out of the goodness of the owners’ hearts for the community and the animals. Henry’s Ark is filled with exotic and local animals such as zebras, bison, deer, ostrich, and goats. It’s a good idea to bring carrots or left over bread or crackers to feed the animals when you go, so you can get a closer look. Sometimes we keep driving down US 42, away from Louisville, to admire more of the farmland. Goshen and Starlight are beautiful cities with so much to offer. We often stop in Goshen at the Creasey Mahan Nature Preserve to run around, or play for a while on their playground. Summer in Louisville is a time for exploring your City. I suggest picking a direction and driving, you never know what you will find. What I have found so far is that Louisville is full of wonderful surprises. For most of us, our home is our biggest investment, and the mortgage we secure to purchase it is the biggest debt we’ll ever undertake. The benefits of home ownership are many, but those who come to the loan closing table ill-prepared will lose out in the end. It definitely pays to do your homework when purchasing Louisville real estate. Here are a few things you can do to make sure you are ready when it’s time to sign on the dotted line. Preapproval – Be sure to have your mortgage lender preapprove you for a home loan before you being your search for properties. Not only will this take the stress off of you later on, but sellers will find the offers of those who are already preapproved far better than those who aren’t. Unlike many parts of the load process, preapproval is relatively quick and painless and can often be done over the phone, so there’s no excuse for not being prepared. Mortgage Type – It pays to spend considerable time studying the various mortgage options available to you and how each of them fits with your circumstances. For instance, your income today and what you expect it to be over the life of the loan, the current interest rate and where it seems to be going down the road, how long you intend to own your home, and how much of a down payment you can afford to make are all factors you should carefully consider. It’s important to have a handle on all of this information so that you can choose the kind of mortgage loan that meets your needs in each area. Budgeting – It’s vital to know how much of a monthly payment you will be comfortable with once the papers are signed and the keys are yours. Your lender may preapprove you for a loan amount whose monthly payments are more than you really want to spend. It’s wise to know your limits from the very beginning so that you don’t end up “house poor.” Consider your lifestyle and remember all of the other expenses that come not only with home ownership, like utilities, cable, insurance, and maintenance but also the other expenses you will have, like food, entertainment, education, travel, and the like. Fine Print – Mortgages are complex contractual arrangements, and they come with lots of stipulations and potential penalties. Do some research on the front end to make sure you can make extra principal payments or pay off the entire loan early without penalty should that become an option for you. Also, check to see if your mortgage is portable and/or assumable. Portable mortgages are those that can go with you when you purchase your next house which allows you to avoid paying discharge penalties. Assumable mortgages are those that the next buyer of your home can take over from you. Buying a home can be an exciting, life-changing adventure. But like most good things in life, it pays to be prepared. Do your financial homework on the front end so that purchasing a home in Louisville makes all your dreams comes true. The Catholic Church Summer picnic season is underway, leading to many sugar filled nights, dizzy-ride induced screams, and gambling excitement. I mean, where else can you go to drink a few cold beers, let your kids run around and get messy, and let the whole family eat delicious junk food without feeling guilty? Because all the proceeds go to a good cause, you can eat, drink, and be merry, without anything weighing you down or holding you back. The St. Anges Carnival has been entertaining folks and serving the community for 15 years and is the largest of the Catholic Picnics in the Louisville area. The festivities begin this week and provide something for everyone. Wednesday, July 18th marks the beginning of the carnival’s week long celebration. Decorated cars and floats will drive up and down Bardstown Road in the Highlands to remind everyone of the impending carnival. Cars will start driving at 6pm and will begin and end at the St. Agnes School. The festivities continue, Thursday July 19th for “Ride Night.” Rides will be open to the public along with limited food options. Booths with remain closed until the official start of the Carnival. Ride Night gives you the opportunity to ride as many times as you like for one ticket price. The 15th annual St. Agnes Carnival kicks off Friday July 20th and features prize booths, cake raffles, a quilt wheel, gambling, and midway rides. The Carnival even has some grand prize events including a $20,000 raffle, and a $100,000 hole in one contest. The food, beer booths and live entertainment are among the most popular draws of the Carnival. Louisvillians who are familiar with the Catholic Picnics, know that the other big Summer Picnic to look forward to is St. Joseph’s Orphan’s Picnic. The St. Joseph picnic began in 1850 with the sole purpose of raising money for the orphanage. The picnic now attracts more than 60,000 people every year. This year, the Picnic will be held on Saturday August 11th. The St. Joseph Picnic will be open to the public between noon and midnight and feature 63 booths, raffles, games of chance, food, and beverages. There are several high-end raffles too, with chances to win cars, trips, and fine-dining meals, all for just $1. Friday August 10, will be the annual Friday Night Live, which will feature live entertainment, and several of the picnic booths, including the fish and bratwurst booth. Friday Night Live will be held from 5pm to 10pm. In the event of rain, the event will be cancelled. It has been a long time since I have attended the picnics. I am looking forward to going back this year, now that I have children, and experiencing the St. Agnes Carnival from a new perspective. I am most looking forward to winning a cake for a dime. I am sure my 2-year-old will enjoy getting to eat whatever his little hear desires and running around in the open air. My husband has been practicing his swing in the front yard the past couple nights (as if it will make a difference) in hopes of winning the hole-in one contest. So I will let you know how that goes. The thing I am looking forward to the most though, is making those memories. I’m sure my two year old will start making them soon; those Summertime memories, picnic memories, good time, family memories. The Dudes, “Achievers“, Walters, and Maudes, are once again invading Louisville. The 11th annual Lebowski Fest kicks off this weekend, Friday July 20th and Saturday July 21st. Lebowski Fest is a two-day event that celebrates the 1998 Cohen Brothers film The Big Lebowski, starring Oscar winner Jeff Bridges as the dude himself. Lebowski Fest was sparked in the midst of a conversation at a tattoo expo. The founders of Lebowski Fest, Scott and Will, were quoting movie lines from the Big Lebowski while at the expo in their hometown of Louisville. When other people started to chime in, quoting the lines they too thought hilarious after hearing 100 times, they had a revelation. Scott and Will thought that if people would show up to a convention about tattoos that they would surely come to an event celebrating the Big Lebowski! They decided to explore this further, and set up a time and date at a bowling alley, put out flyers, and waited to see what happened. The first annual Lebowski Fest was a success, attracting dudes from near and far. Each year since then, Lebowski Fest has grown in size and popularity, and is now in over 15 cities. The Party officially kicks off Friday with the Movie Party. There will be music by Mucca Pazza, a 30 piece marching band, followed by a screening of the Big Lebowski. The Movie Party will take place at the Executive Lawn, located at 911 Phillips Lane and Tickets to this event are available in advance for $15 or at the door for $18. The doors open at 8pm and the show begins at 9pm. The celebration continues Saturday with the Garden Party. There will be several bands performing, including Todd Snider, the Deloreans, and The White Russians. Not only will there be musical entertainment, but the Derby City Dating Scene Improv Troup will be hosting a Lebowski Improv Set, and the Big Brothers Big Sister of Kentuckiana will be hosting lawn games. The Garden Party will also be at the Executive Lawn and gates open at 4pm. Tickets are available in advance for $10 or $15 the day of. Saturday night is the Bowling Party. 8pm at the Executive Strike and Spare there will be trivia, costumes, contests, and special guests. Tickets are $25 in advance and $30 the day of.The ticket price includes shoes and bowling, but bowling is not guaranteed. New this year is an after party hosted by the Monkey Wrench. With guest DJ Jason Clark, and delicious food trucks parked outside, prepare to dance, drink, and eat the night away. The party will take place in the bar at the Executive Strike and Spare from Midnight- 4am. The event is 21and over, for obvious reasons and is free. There are several other events you might be interested in going to if you are a die hard dude or “Achiever.” Thursday, July 19th at Carmichael’s on Frankfort Avenue Peter S Fosl, author of “The Big Lebowski and Philosophy” will be doing a book signing in the store. The event will begin at 7pm. There will also be an expert panel discussion Saturday at 3pm at the Executive Strike and Spare on the best costumes in Lebowski Fest’s history. Both of these events are free and open to the public. Lebowski Fest has become one of Louisville’s great Festivals. The unique, fun, and quirky, spirit of the festival matches Louisville’s essence to a tee. The Lebowski Fest is a weekend filled with pure joy and carefree child’s play, that I highly recommend everyone experience at least once in their lives. Highlanders have found themselves wrapped up in yet another mystery, the sudden and unforeseen closing of the Avalon restaurant. Avalon abruptly closed it’s doors last week, posting white paper signs in the windows stating their closure was due to “unforeseen circumstances.” Avalon opened it’s doors in 2002 and was one of the most popular hot spots on Bardstown Road’s Restaurant Row. Avalon has won numerous award and accolades over it’s ten years of service. Most recently it won Metromix Louisville’s Best Date and Special Occasion Spot, Best of Louisville Award for Best Patio Dining, and was given over ten published reviews and write-ups in the last year. The Lobster Mac and Cheese, signature cocktails, and lively patio were all staples of Avalon that will surely be missed by many. I walked by the front of the restaurant yesterday, and I peeked inside the large windows to see what shape it was in. It was rather odd, as if someone came in and told everyone to drop what they were doing, mid sweep, and leave. Dust pans are still by the bathrooms, tables are still set, and nothing seems to be touched from the end of dinner service. Something didn’t seem right. Avalon was a hip restaurant, a place to be and be seen, nearly always busy. So what could force them to close their doors, and so suddenly at that? In just the past couple of days, information has started to surface, that is helping us understand why Avalon had to shut down. Steve Clements, owner of Avalon, is also the operator of Clements Catering. Clements Catering was headquartered at the Kentucky Derby Museum up until a week before the mysterious closing of Avalon. Apparently, Clements was let go by the Kentucky Derby Museum, and is now being sued by the Museum, citing “unresolved conflicts.” There is speculation that for the past few years, Clements has been defrauding the Kentucky Derby Museum with “creative accounting.” Neither side has come out and said that this is the case, but the Kentucky Derby Museum is asking for compensation plus punitive damages. Clements is the owner of Luna Boutique as well. Luna Boutique offers jewelry, accessories, and spa treatments. Luna Boutique is still open and having a 50% off sale, but their future is still unknown. It is really a shame to lose a great restaurant like Avalon, especially so suddenly. In time we will see what happens with this story, if Avalon will ever re-open, or if it is gone for good. The good news is that in Louisville we are not lacking in the great food department. We will survive without Avalon’s Lobster Mac and Cheese, it might be hard for a while, but we will find a way. Am I the only one that is missing Starlight Frozen Custard? With these past couple weeks of triple digit heat, by body has been aching for some good Summer treats and it is yearning for one of my forgotten favorites. Starlight was around before we were bombarded with do-it-yourself “fro-yo” spots, that have become the hip new thing, but couldn’t make it after the new trend took over. The abandoned Starlight sign is still standing at the corner of Shelbyville and Hubbards Lane teasing my taste buds every time I drive by. Although I don’t feel like anything can replace my beloved frozen custard, I have to admit, these frozen yogurt stores are slowly starting to win me over. I visited my fist do-it-yourself frozen yogurt store while visiting my brother in California several years ago. I thought it was a cool idea, I liked the fact that I was in charge of my dessert, but thought it was for the California health freaks who didn’t want to eat too much ice cream. The first Fro-yo store I saw in Louisville was Sweet CeCe’s on Bardstown Road and I knew immediately it would be popular. Something hip, cool, and different? Louisvillians love that! Not only was I right, but I was sucked into the Sweet CeCe’s trap. Starlight was closed down, I was pregnant, and living two blocks away, there was no hope for me. 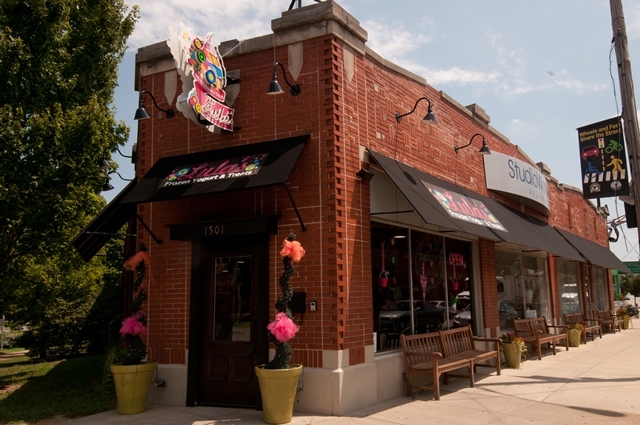 Since Sweet CeCe’s (Now Lula’s) opened in 2011, nearly ten other frozen yogurt places of the same design have opened there doors in the Louisville area. Do we really need all these fro-yo joints? Are they staying busy? I decided to investigate. I traveled down Bardstown Road to two of the more popular frozen yogurt spots that have been competing with each other from the beginning. Cefiore was the first frozen yogurt shop to dawn the do-it-yourself cap, followed by Sweet CeCe’s (now Lula’s) which opened up right across the street. I went in to Lula’s first to ask some questions. It was a Thursday afternoon when I first started my research and I was the only one in the store. My 2 year old son and I shared a vanilla cup will rainbow sprinkles, Oreo cookies, and strawberries (we like to keep it simple). I asked the girl who was working how busy they were and she looked at me with a look of dissatisfaction. She went on to say that they were busy in the evenings but nothing like they used to be. She told me that the owners decided not to renew their franchise contract and are now privately owned. Apparently, when they decided not to renew their contract, they were the second most successful Sweet CeCe’s Franchise, next to the original. At one point it was working for them, there were lines out the door 24/7. So what happened? Was it the competition or is Louisville just over the excitement of the “newest big thing?” I think it’s a little bit of both. After getting some information from Lula’s, I crossed Bardstown Road to Cefiore. I was immediately impressed with the freshness of the toppings and the unique menu. All of the fruit options, and candy options looked very appetizing and the bubble tea and snow ice options were an interesting twist to the menu. I decided to try a bubble tea as I never had indulged in one before. I ordered a green tea bubble tea and watched the woman behind the counter go to work as if doing a science experiment. Not only was it fascinating to watch, but drinking it after, was equally as entertaining. I almost forgot while in Cefiore, that again, I was the only customer because the woman working behind the counter was so engaging and friendly, she even insisted on holding my 4-month old son. So what did I take away from this “research?” Well, I’m not sure if there is a place for nearly ten frozen yogurt places in Louisville. I have been to others around town, and they are all pretty much the same. Cefiore is offering something unique and their ingredients are fresher than other places I have seen. These are the things that will keep a place in business. My prediction is that in the next year, we will be seeing a lot less fro-yo around town. Brad Long is a real estate Broker based in Louisville, KY. You can contact him and search for Louisville Real Estate through his website. It’s that time of year again . . . Homearama 2012. This year’s new homes showcase runs from July 14 – 29 at Rock Springs and Shakes Run. Even if you aren’t interested in that particular area, the size or style of the homes on display, or ever building a home yourself, the best thing about Homearama is all of the great decorating ideas you can get just by visiting. Home owners in Louisville are doing just that and learning great new design tips for their own houses. The key to learning from what you see inside these homes is to deconstruct the various parts of a room you like to figure out just what it is that works for you. Too many folks take one look at the professionally decorated rooms and think, “I could never do that,” or “I don’t have that kind of money.” You don’t have to be wealthy or have a degree in design to learn things that you can do in your own home from the pros. Just keep these simple tips in mind when you visit. Separate the substance from the overall style. A room you see at Homearama may be far too contemporary for your more traditional tastes, but that doesn’t mean you can’t pick up a few great decorating tips from how that room was put together. Focus on design elements – like color, texture, and furniture placement – rather than the style of the individual pieces you see in the room. They may not appeal to your tastes, but perhaps the mix of wall colors or the clever way accents are used to add drama is something you can replicate in your own space. Remember that color is king. Designers of showcase homes spend a lot of time choosing colors that will make a statement. Many will try new techniques and color combinations to see what kind of reaction they will get. Even if the paint colors aren’t ones you would choose for your own home, you can still learn a lot about how the pros use color. For instance, notice if a room has walls painted different colors or shades and which walls were chosen for the different hues. Also, pay attention to any paint treatments you notice as you’ll see some experimental techniques on display that might be all you need to update a room in your home without a major overhaul. Don’t forget the details. While many visitors to Homearama are overwhelmed by the visual display from one room to the next, the savvy design-minded spectator will remember to focus on the details. For instance, how are accents, like throw pillows, wall hangings, or other art pieces, placed? How many are there and where are they situated? And how does their color play off of the rest of the room’s décor? Learning from the Homearama pros about how to wisely use accent pieces can help you transform a room on a very limited budget. Homearama 2012 is a great opportunity to learn ways to freshen up the look of your own home from the work of professional designers. If Louisville home owners separate the style and furnishings of the home they visit and focus instead on the essential elements of design, like color and the use of accents, then it’s easy to use those design tips to liven up their own spaces. Check out Louisville Real Estate for the latest happenings or to search for your dream home. While many Louisvillians checked out the Forecastle Festival at the Waterfront, others headed Eastward on River Road toward the Water Tower to the annual Blues and Barbecue Festival. Celebrating its 15th anniversary, the Blues and Barbecue Festival hosted bands, The Predators, Big James & The Chicago Playboys, Davis Coen, Stella Vees, and a Louisville favorite, The Stray Cats Blues Band. Barbeque was provided by Frankfort Avenue Beer Depot and The Q. The menu consisted of regional barbeque staples including ribs, beef brisket, pulled pork, chicken, and my favorite, roasted corn. I brought a couple of folding chairs to sit on and enjoyed the sights, sounds, and smells. The crowd is delightfully diverse, and the mood is laid back. If you are looking for a night out to relax and listen to some good music, eat some good food, or let off some steam with some dancing, it’s a great event to attend. All this talk about Barbeque got me thinking about a trip my husband and I went on recently. We left our Louisville Home, flew to Texas, rented a car and drove to New Orleans and then through Memphis to get back home to Louisville. We sampled the best food each city had to offer. In New Orleans we sucked the heads of crawfish and ate alligator gumbo. We had to go to Café Du Monde for chicory and beignets and then to a proper Commanders Palace feast. We were in Heaven. What I found most interesting though, was our barbeque trek. We had Texas barbecue in Houston, and then did a barbeque walk through Memphis comparing all the popular and not so popular spots. Comparing Memphis’ own barbeque places to each other, and then Memphis to Texas, and then Memphis and Texas to Kentucky, I was dizzy with barbeque on the brain. I was learning just how competitive and personal an art form barbeque could be. With every bite I took, I was spellbound with how complex the flavors could get and how different each rub or sauce could be. Here in Louisville we have an unbelievable amount of successful and delicious barbecue joints. I live in the Highlands and in just a short distance from my house there is Marks Feed Store, Frankfort Avenue Beer Depot, Hammerheads, and Smoketown USA. If I want to go just a little but further I can go to Doc Crows, The Smokehouse, and Jucy’s Barbecue, and that’s not even all of them! Barbecuing is a delicious American tradition, that almost everyone has an opinion on. Louisville’s Barbeque scene is growing, and I’m happy to be the one to taste and compare each new place. For more information about Louisville and what's happening around town visit Louisville Real Estate - who knows, you might even find your dream home. Louisville’s music community suffered a tremendous loss after the December 2011 closing of the beloved ear X-tacy record store. Ear x-tacy served Louisville for 26 years, supplying music lovers with vinyl records, CDs and posters, introduced young artists to new sounds, and hosted some amazing bands for the community’s enjoyment. With the closing of ear X-tacy it was truly an end of an era. No record store will ever take ear X-tacy’s place, but one has just come on the scene that is making it a little easier for the Louisville music community to move on. Matt Anthony, former music buyer for ear X-tacy, has opened up his own record shop. “Matt Anthony’s Record Shop” is located in the Tim Faulkner Building on Franklin Avenue in Butchertown which is a new arts complex and gallery. Anthony says he has always dreamed of having his own record store but didn’t want to compete with ear X-tacy. Anthony helped fight to save the store and was there with them until they closed. Inside his store you will recognize racks and signage from ear X-tacy, as he bought a lot of the inventory after they closed. Matt Anthony is also a 91.9 WFPK DJ, currently DJ-ing the Friday Night Sound Clash and the Jazz Pulse on Sundays. Anthony’s background, traveling and living on an Air Force base has shaped his love for music and art. Anthony grew up in Italy on an Air Force Base, and credits that with his love for Hip Hop and Jazz music. In Italy, Anthony says that American music was not easily attainable, so he would track down the one American Hip Hop CD that would become available, making him the go-to guy for music. He became the go-to DJ, and fell in love with it. Anthony said that because American music was so hard to come by, it was appreciated much more in Italy. His appreciation for Hip Hop, Jazz, and Soul music grew stronger because of it’s heightened appreciation. Anthony was not only interested in music, but other art forms as well. Anthony received a degree in art with a focus in illustration from the Academy of Art in San Francisco and then Attended the University of Louisville as a Roman History major. Anthony’s love of music and art is apparent in his new shop. Anthony’s paintings adorn the green walls, eye-catching posters fill the racks, and rows of music line the store. Anthony will be the first to admit that he is not good at selling his art, which is why he is happy to be part of the Time Faulkner Building. The Gallery will be a great place to showcase Anthony’s artwork and expand his business. If you want to see Anthony DJ live, you can find him at Meat at 9pm on Mondays. 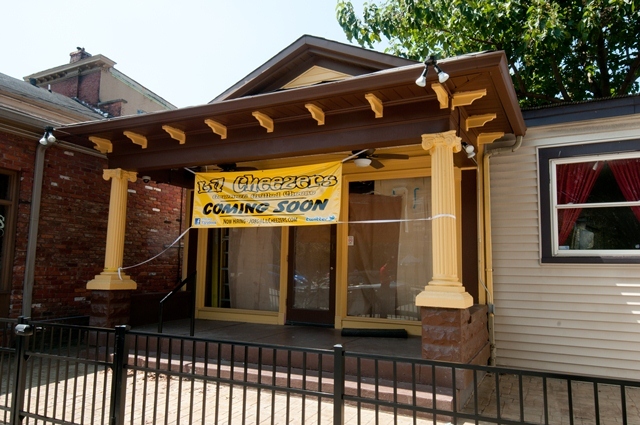 Meat is located at 1076 E Washington Street. Matt Anthony’s Record Shop is open Tuesday-Thursday and Saturday from noon-7pm, Friday noon- Midnight, and Sunday noon-6pm. Anthony has said that he believes that good vibes are important and that there is an overall good feeling that comes with shopping locally. I couldn’t agree more. Stop in to his store and spread some good vibes around. We need to support these local gems. If you like music, Louisville’s got it all. From bluegrass to gospel, classical to contemporary, pop and hip-hop to country and western, and everything in between - you can find it all in Derby City. And Jazz is certainly no exception. Louisville has a history of nurturing jazz talent, and this summer is a great time to experience this timeless musical genre. Now through mid-July, over 600 young jazz musicians are in town for the Jamey Aebersold Summer Jazz Workshops at the University of Louisville. Weeklong and two-day workshops are taught by some of the greatest jazz professionals from all over the country. And the best part is that student concerts are free and open to the public. From noon until 5:00 p.m. on July 13, you can come by the Comstock and Bird recital halls to hear some great music with no charge. Then the week of July 23, professional jazz musicians who have been in town to teach at the workshops will perform free of charge at 7:30 p.m. most evenings. Check out www.jazz.louisville.edu for more information. Another hidden gem on the Louisville jazz scene is the Sunday service at Clifton Unitarian Universalist Church. Each week, a jazz trio of U of L students wows church-goers there with their talent and youthful energy. And if you consider visiting because you’re more interested in the music than the service itself, no problem. The folks there won’t give you a hard time, and you’ll be amazed at the great, free jazz you’ll hear. Of course, Louisville offers more than just free jazz opportunities. Professional artists visit frequently as well. One such highly anticipated concert will take place at Churchill Downs at 6:00 p.m. on August 24 when contemporary jazz musician Marcus Johnson performs. Tickets are $100, and the proceeds support the Lincoln Foundation’s major educational initiative, the Whitney M. Young Scholars Program. Louisville residents who love jazz have lots of opportunities to indulge their interests around town at everything from free concerts to top notch professional performances. And these events are just a few of the many opportunities available. To explore them all, check out Louisville Jazz Society. You’ll be thrilled with the breadth and depth of possibilities you’ll have for jazzing things up a bit. Check out Louisville Real Estate for the best home search available. Urban Mistake in The Louisville Highlands? I have to admit, when I saw that they were putting an Urban Outfitters just two blocks from my home in the Highlands - I had a flood of emotions running through my head. I was excited of course, I think that was the biggest emotion; I am FINALLY, not going to have to drive to Cincinnati every time I want to find a funky pillow or a fun sweater! And then of course the second emotion came bouncing into my brain, the guilty one, I have responsibilities; I can’t have an Urban Outfitters so close to my house! That’s way too tempting! Oh boy, I am an adult, I can manage this, I will be ok. Recently however, something has surfaced that may make it easier to avoid the store that would usually haunt my dreams and tempt me in to buying a pair of earrings or a clutch I didn’t need. In case you don’t know where in the World I am talking about, the Urban Outfitters is replacing the Blockbuster in the Tyler Park Plaza on Bardstown Road in the Highlands. Tyler Park Plaza is made up of Highland Coffee, the Knit Nook, and soon to be Urban Outfitters. Highland Coffee is one of my favorite coffee shops in town. My husband walks up there a few days a week while I’m slowly getting out of bed because for some reason he thinks that’s easier than brewing it at home, but we won’t get into that. Anyways, we love Highland Coffee, as do many people in Louisville and especially the Highlands do. Highland Coffee has been in business since 1999 and is proudly locally owned. They serve Organic fair-trade coffee, and gluten free desserts, and in my opinion make some of the best lattes in town. 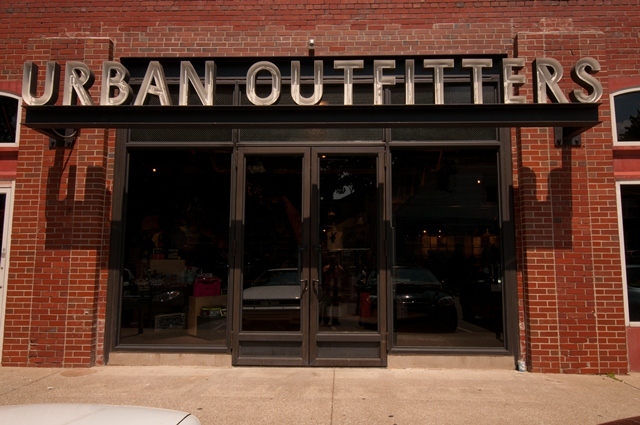 Driving down Bardstown Road a couple weeks ago, I noticed Urban Outfitters’ new sign, replacing the sign that was for Highland Coffee and the Knit Nook. At first I didn’t think too much about it, distracted by the chopped up words on the sign. I was bemused at the lack of signage for my beloved Highland coffee. The bullies had pushed them out. My blood began to truly boil after I read the piece that the LEO wrote on the subject. Now I am really beginning to understand what is going on. The LEO got in touch with Greg and Natalie Hofer, the owners of Highland Coffee and they explained that they have been trying repeatedly to contact Urban Outfitters about the sign and have received no response. Those goons! The worst part of it is the only contact they have had with Urban Outfitters is when they came into the coffee shop with a stack of applications for their employees…the nerve. I know Urban Outfitters did not do anything illegal, they are probably paying the majority of the rent and they should probably get rights to signage, but there is such thing as common courtesy and they are not showing any respect. Highland Coffee will benefit from Urban Outfitters in the long run, but Urban Outfitters has already put a bad taste in all of our mouths before they have opened their doors and in a city that respects local business that goes a long way. If you would like to find out more about the area and the homes for sale visit Highlands Homes Louisville - the most comprehensive search site available. A 21st Century Medical Center is due to replace the existing Robley Rex VA Medical Center which is 60 years old. The current VA Hospital is located off of Zorn Avenue and is said to be outdated and overcrowded. The new, updated Hospital, will sit adjacent to the Brownsboro Rd and I 264 Interchange will “provide state of the art healthcare for the veterans of Louisville and the surrounding 35-County region.” according to Secretary of Veterans Affairs, Eric K. Shinseki. The new VA Hospital is going to have the best of the best. The Hospital will have 110 inpatient beds, an extended care program, and a home-based primary care program. There will be specialized clinics in primary care, surgery, and mental health as well as substance abuse residential rehabilitation treatment program. The new VA Hospital is planning to open its doors in late 2017 or early 2018 and is expected to cost $883 million dollars. Senator Mitch McConnell has secured 75 million dollars of the cost. Last year alone, Kentucky spent 1.9 billion dollars on its 331,000 Veterans. That cost is spread between Louisville’s existing VA Hospital, Lexington’s two-campus medical center, roughly twenty-four clinics, and seven veterans’ cemeteries. Many residents of the area are concerned with their new neighbor. With the sudden influx of so many patients, visitors, and medical personnel, many are concerned about traffic, safety, and property value. Congressman John Yarmuth has addressed the concerns about traffic, assuring residents not to worry and that those issues will be addressed. Many Brownsboro Road area residents are left unsure and wanting their questions answered. Some of the neighborhood's directly affected by the new VA Hospital will be Northfield, Crossgate, and Winding Falls. Only time will tell how the location of the new VA Hospital will affect these Louisville neighborhoods, but for now, everyone seems on edge. Local businesses however, are ecstatic! Vint Coffee said they cannot wait for the hospital to open up right across the street and I’m sure we can all figure out why. The many fast-food restaurants will get a boom of business. And with the addition of the VA Hospital to the area, it’s only a matter of time before the Holiday Manor Shopping Center (which has been the same for years) will be turned into a Summit-like destination, following the trends. I guess we have to take the good with the bad, and at the end of the day realize The VA Hospital will be doing a lot of good. A true mystery lies in the heart of the St. Matthews community and it has me digging for clues. While doing construction on the building that held the beloved Dutch’s Tavern and will be the newfound home of the Mellow Mushroom Pizza Joint, a bewildering sign that has become my nemesis was discovered. The sign reads “Baker Boy inc. Hot Doughnuts.” You would assume there was a doughnut shop there some years ago, but, no. No such place ever existed, no Baker Boy Doughnut Shop to speak of. I was bewildered. After doing a little digging I came across an article by WHAS11 news with the title “Historic Mystery in St. Matthews Appears to Be Solved” and finally I think I am going to get my answers. In the article they explain the establishment was a soda shop that changed to a tavern after prohibition. I read on. That’s it? So where do the doughnuts come into play? Where’s the rest of the article? Where is the answer to my mystery? I am stunned. I guess I have to keep on digging, and I will. By this point I think I have built up in my head that it is some great mystery I am trying to solve. I am not basing myself in reality anymore. I remind myself I am looking in to a doughnut shop, or a soda shop that sold doughnuts, I bring myself back down. I stumble across a message board where members are talking about family members that worked at the soda shop at the time. I chime in to the conversation. We are talking about the possibility of a doughnut shop going unnoticed and the lack of that possibility. After much discussion, we come to a conclusion that the sign must have been advertising for doughnuts sold within the soda shop. This makes sense, I am comfortable with this deduction. I have spent too many hours scowling the internet and wracking my brain over doughnuts and baker boys. This is a logical and simple conclusion. My mystery in St. Matthews is solved and although it wasn’t an exciting, mind-blowing finale, I will take solace in the fact that it is indeed concluded. I apologize if you are as let down as I was, but not every mystery can turn out so exciting. I will try to report on another one of Louisville’s great mysteries next time with a more thrilling outcome. Mellow Mushroom is set to open it’s doors the first week of August according to the Courier Journal. This funkadelic pizza chain offers a delicious menu including pizzas, calzones and salads, along with a hefty beer list and plenty of on tap options. Mellow Mushroom participates in things like Beer Club and Trivia Nights, so check with them when they open to see how you can participate. After visiting the Lexington location I am eager to return and recommend it highly. Mellow Mushroom plans on conserving the Baker Boy Sign in it’s entirety and including it as part of their restaurant decor. To find your St Matthews dream home go to St. Matthews Homes for Sale for all of the most current listings. Every day, twelve abandoned Louisville homes are boarded up with plain plywood boards, instantly decreasing the homes’ value, the areas resale values and leave an eyesore for the neighborhood. CJ Fletcher, Special Events Coordinator for the City, and acclaimed artist, is working to do something about this problem spanning throughout our beloved City. “Blight Out and Brighten Up” reaches out to volunteers to help paint the plywood boards that will be boarding up these abandoned Louisville homes. Fletcher believes that bringing art to what would otherwise be run down homes, will not only cheer up any passerby’s, but will also help fight property deterioration and help deter the resulting decreases in values. No one can argue that almost anything would be better than those hideous plywood boards, and art seems a treat. There have been two painting sessions so far, and volunteers seem very excited about the project. All the supplies have been generously donated and volunteers have been coming out in great numbers. The last painting session was held at the old Armored Car building at 6th and Zane in the Limerick neighborhood of Old Louisville. Plans are underway to turn the building into an arts complex featuring a theatre, art gallery, and coffee shop called Vault 1031 (more info to come). Crews have begun to put up some of the boards, and professional artists are hard at work painting the existing boards on these Louisville homes, so keep your eyes out for the functioning art around town. Another painting session will be held in the fall at the Vault 1031 space and is open to the public. Check back for date and time information. Go to Louisville Real Estate to search for all available homes for sale in Jefferson and surrounding counties. Louisville is known for its wide array of festivals throughout the year celebrating everything from history and hobbies to culture and cuisine. Louisville real estate owners anxiously await the return of one of the premier festivals outside of Derby Week, the Forecastle Festival that runs from July 13-15 downtown at the waterfront. Now in its tenth year, the Forecastle Festival celebrates music, art, and activism. In addition to providing first class entertainment, the festival also seeks to raise awareness about the issues important to the Forecastle Foundation, which is a non-profit organization whose mission is to educate and inspire action that will protect the world’s most compromised “hot spots.” Just what is a “hot spot?” The term first used by the British environmentalist Norman Myers in 1989 to describe tropical forest areas of the Earth that have an amazing array of biodiversity but also experience serious threats to their sustainability. One festival activity that highlights the importance of protecting these hot spots is the Sustainable Living Roadshow, which involves a group of entertainers and educators who travel the country in vehicles powered by renewable fuel and set up “eco-carnivals” designed to raise awareness in a fun way. Some individual elements of the roadshow that draw a crowd are the Conscious Carnival, Green Marketplace, bike-powered Roadshow Café, and other engaging workshops and speakers. But even those without an activist bent find the Forecastle Festival to be one of the most entertaining events of the years. Music lovers from across the country come to Forecastle for top notch concerts. Although a major draw for the music crowd will be the wildly popular group, My Morning Jacket, the festival also features concerts by a wide variety of other great bands like Paper Diamond, the Preservation Hall Jazz Band, Dean and Britta, Purity Ring, Emancipator, Dr. Dog, and Scarlet Smile, to name only a few. Art fanatics will also be in seventh heaven at the festival. The Whoop de Do art collective, a community arts project from Kansas City, seeks to provide unique artistic experiences that involve people of all ages and cultures. For this year’s festival, they have created The Ghost Ship, an interactive display that will amaze and delight. This along with the many other celebrations of art at the festival be hard to top. Part of the fun of living in a city as energetic and diverse as Louisville is participating in its many festivals. Louisville home owners will be joining others from all over the country this month at the Waterfront for the highly anticipated 10th annual Forecastle Festival, called one of the “31 Coolest Tours and Festivals” in the country by Rolling Stone magazine and one of the “Top 10 Events in the State” by the Kentucky Tourism Council. Whether your interest is music, art, or environmental issues, it’s sure to be a weekend you won’t soon forget. For the best home search available go to Louisville Real Estate and sign up for a property tracker so you will be notified whenever a home comes on the market that fits your needs.